WASHINGTON Firefighters and mechanics tried repeatedly to put out a battery fire aboard a Boeing (BA) 787 Dreamliner through smoke so thick they couldn't see the battery, according to documents released Thursday that portray the incident as more serious than previously described. The Jan. 7 fire at Boston's Logan International Airport is under investigation by the National Transportation Safety board, which released laboratory analyses, interviews and other data it has gathered so far. It still hasn't been able to pinpoint the cause. Federal Aviation Administration officials are expected to make a decision in the next few days on whether to approve a plan by Boeing to revamp the 787's lithium ion batteries to prevent or contain future fires. Once the plan is approved, Boeing hopes to swiftly test the reconfigured batteries and get the planes back in the air. Dreamliners worldwide have been grounded since a second battery incident led to an emergency landing in Japan nine days after the Boston fire. The incidents have raised questions about the safety of using lithium ion batteries, which are more susceptible to igniting if they short-circuit or overheat than other types of batteries. The episodes also have called into question the FAA's process for certifying the safety of new aircraft designs. 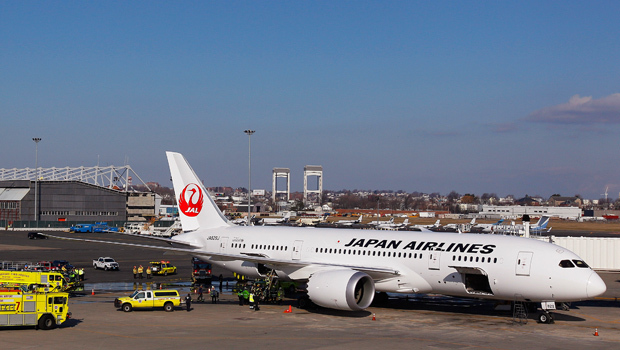 The Boston fire occurred aboard a Japan Airlines plane that had just landed after an overseas flight and was parked. A cleaning crew discovered smoke near a kitchen in the rear of the plane six minutes after the last of the 184 passengers walked off the plane, and one minute after the pilots left. A mechanic investigating the source of the smoke in an electronics bay found intense smoke and three-inch (8-centimeter) flames in two places on the housing covering the battery. Attempts to put out the flames with a dry chemical fire extinguisher were unsuccessful. The first firefighter to enter the plane reported seeing "a white glow about the size of a softball" through the smoke using his hand-held heat-imaging camera. He applied another type of fire extinguishing agent, which somewhat reduced the glow. An airport security camera video showed white smoke billowing from the underside of the plane. Another firefighter entering the electronics bay reported "no visibility" because of the smoke and directed another burst from a fire extinguisher at a hot spot, but the battery seemed to rekindle. A fire captain applied the extinguisher again for about five minutes, reducing the fire. But the battery was still emitting heavy smoke and hissing loudly. Liquid was flowing down its side. Lithium ion batteries contain a flammable electrolyte. Firefighters finally decided to remove the battery from the plane, but its "quick-disconnect knob" was melted, hampering the process. Investigators later found little balls of melted and cooled stainless steel, apparently from the cases of the battery's eight cells. That type of steel melts at 2,700 degrees Fahrenheit (1,480 degrees Celsius) one document noted. The bottom of the battery box was bent from where firefighters pried it out. In all, it took an hour and forty minutes to quell the fire. The report said several kinds of battery failures can cause the battery to smoke. Those include short circuits, recharging a battery that has been allowed to discharge too far and charging at cold temperatures. But unless something outside the battery ignites it, only overcharging it will cause it to burn, according to a report by NTSB engineer Mike Hauf, citing a Boeing safety assessment. That raises the question of whether there were different causes for the fire in Boston and the Jan. 16 incident aboard an All Nippon Airways plane, where the battery smoldered but flames were not reported. ANA confirmed this week that it replaced three circuit boards located in 787 electronics bays after pilots received an error message during flights in March, April and June of last year. One of those circuit boards had a "slight discoloration," said ANA spokeswoman Nao Gunji. Nothing wrong was found with the other two, but they were replaced as a precaution, she said. The 787 is Boeing's newest and most technologically advanced plane. It is the world's first airliner made mostly from lightweight composite materials. It also relies on electronic systems rather than hydraulic or mechanical systems to a greater degree than any other airliner. And it is the first airliner to make extensive use of lithium ion batteries, which are lighter, recharge faster and can hold more energy than other types of batteries. Boeing has billed the plane to its customers as 20 percent more fuel efficient than other midsized airliners. That's a big selling point, since fuel is the biggest expense for most airlines. Airlines have been forced to tear up their schedules while the planes are out of service. United Airlines recently cut its six 787s from its flying plans at least until June and postponed its new Denver-to-Tokyo flights. United is the only U.S. carrier with 787s in its fleet. LOT Polish Airlines has said the grounding of its two 787s is costing it $50,000 per day. The airline has said it will ask Boeing for compensation. Norwegian Air Shuttle, which was due to receive 787s this year, said it will lease two Airbus A340s along with flight crews for its planned New York-to-Bangkok flights if it doesn't get its 787s on time. The airline is allowing customers on 787 flights to change their flight date or get a refund, but "very few have taken advantage of this offer," spokesman Laase Sandaker-Nielsen said Thursday. Boeing is still building 787s, but deliveries are halted. It has not said how much the battery problems will cost. UBS analyst David Strauss estimated Boeing will burn some $6 billion in cash on the 787 this year - and that's even if it delivers more than 60 of them. Every missed 787 delivery adds as much as $120 million to the plane's cash burn this year, he estimated in a note on Tuesday.